Do you ever go on a road trip and find something really cool, only to research it later and realize that though it was a great stop, it could have been even MORE INCREDIBLE had you known what was nearby? Yep. So have I. And today I’m going to share one of those occasions with you. 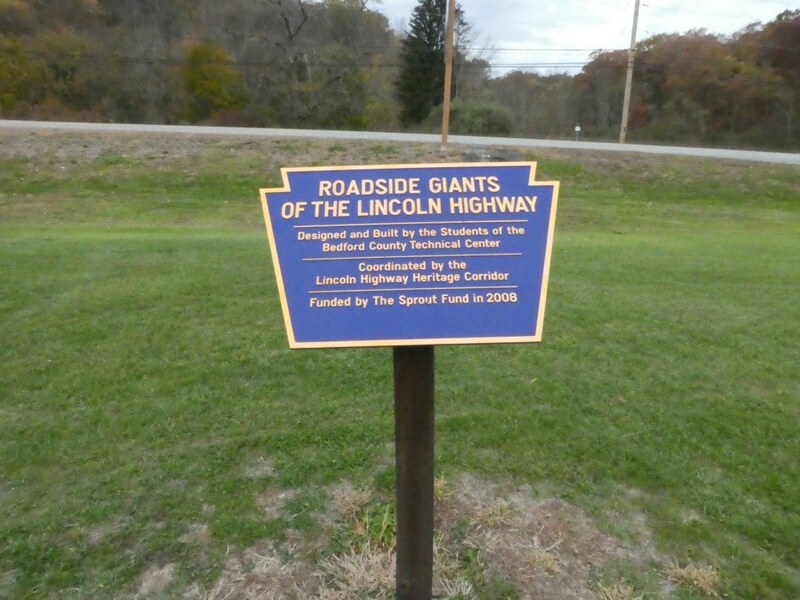 My husband and I recently traveled along the Lincoln Highway through portions of Pennsylvania on our way to and from the Sight and Sound Theater with my mom and dad. On the way home, we sought out a giant quarter roadside attraction located at the entrance of a golf course just east of Everett. When we stopped and I hopped out to take photos (because one photo of this huge attraction would never be enough), I spotted a sign that I also took a photo of. I read it quickly and was intrigued by the word “giants”, as in plural. Were there more of these attractions nearby? I made a mental note to look it up on my phone when I hopped back in the minivan. Well, my memory isn’t what it used to be and I have a really hard time staying focused on a good day so by the time I had finished taking photos, in like three minutes, I’d forgotten all about the sign. 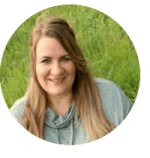 Until now, when I returned home and started writing this post. It only took me four weeks to remember what I’d read. And now, I’m all kinds of disappointed. 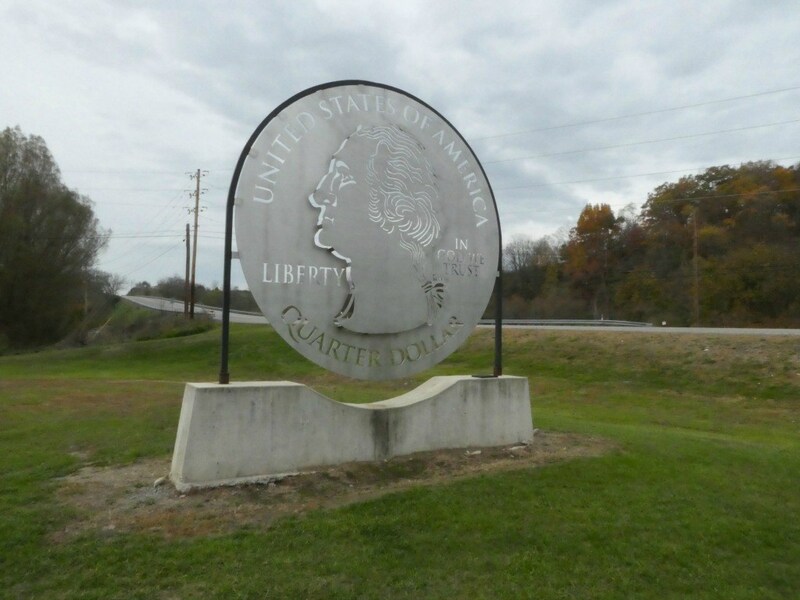 You see this giant quarter in Pennsylvania is one of five huge roadside attractions along the historic Lincoln Highway. And this doesn’t even count the Coffee Pot we saw in Bedford or the Shoe House that I got a brief glimpse of as we passed by York. Those are historic structures. Original examples of novelty architecture. I’m talking about the new, giant attractions along the 200-mile Lincoln Highway Heritage Corridor. The project was made possible with funding secured by the Lincoln Highway Heritage Corridor in 2008. High school kids enrolled in the Career and Technology Schools teamed up with local manufacturing plants to bring these projects to life. They are now permanently installed along Old Route 30. The students at the Bedford County Technical Center had chosen a quarter because of the area’s connection to our first President, George Washington. He marched his army to Bedford in 1794 to stifle the Whiskey Rebellion and stayed at the Epsy House and drank in the taverns. I had wondered why they didn’t opt for a giant penny since it is located on the Lincoln Highway and now I know why. At any rate, the massive coin weighs nearly a 1,600 pounds, is 20-feet in diameter, and took three days to construct. Don’t get me wrong, I’m thrilled to have seen the quarter. I really am. I just wish I had known about the other attractions so I could have seen those too! In addition to the quarter, there is a 1920’s Packard Car and Driver on Tollgate Hill Road in Greensburg, a replica of a 1940’s Bennett Gas Pump in Latrobe, a 1,800 pound Bicycle Built for Two in Somerset, and a 1921 Selden Pick-up Truck just west of Chambersburg. You’ll find the quarter at the Down River Gulf Course at 134 Rivers Bend Dr, Everett, PA 15537. There’s plenty of space to pull over safely at the golf course for some fun photo ops for this one. 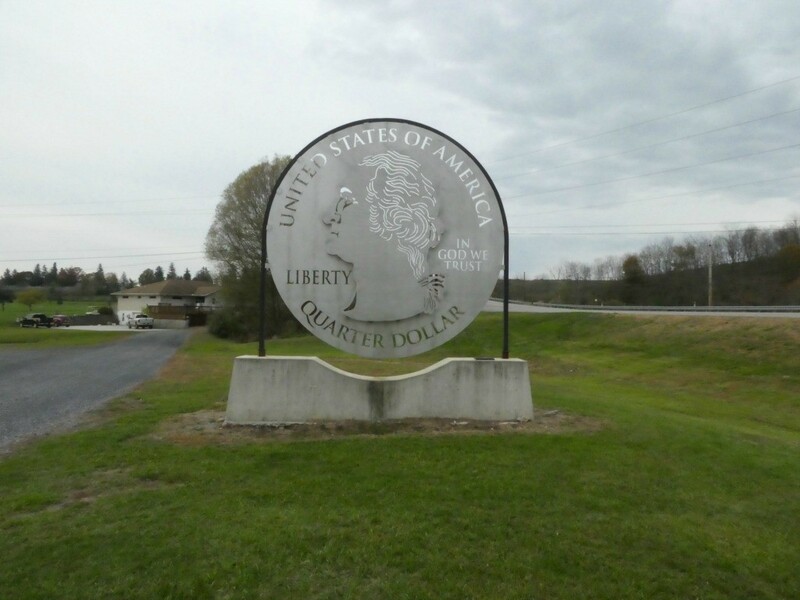 Have you seen the giant quarter in Pennsylvania? That is so funny. I LOVE that you stopped for a photo op. 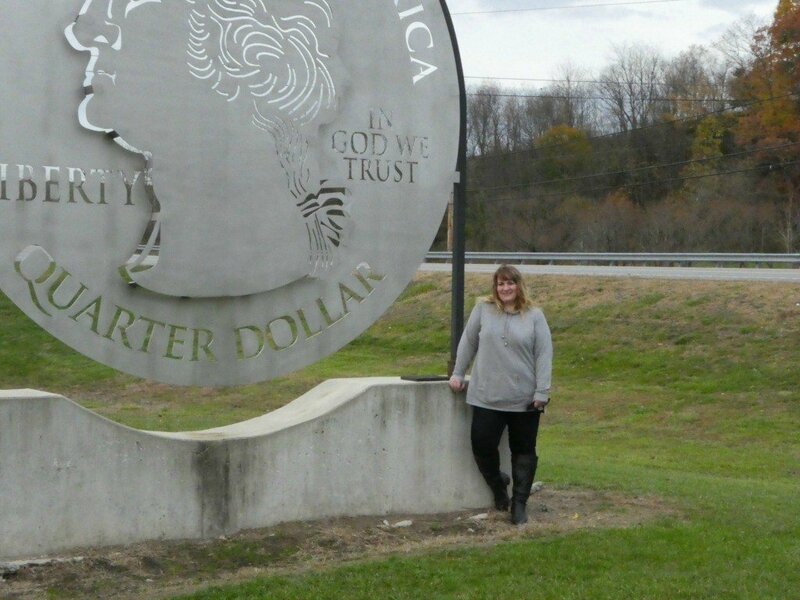 “At any rate, the massive coin weighs nearly a 1,600 pounds, is 20-feet in diameter, and took three days to construct.” – Impressive!!! Love roadside attractions! Tonya, I have a feeling we would be great travel mates. I love finding kitschy stuff like this! This is great! I love quirky road trip finds like this. 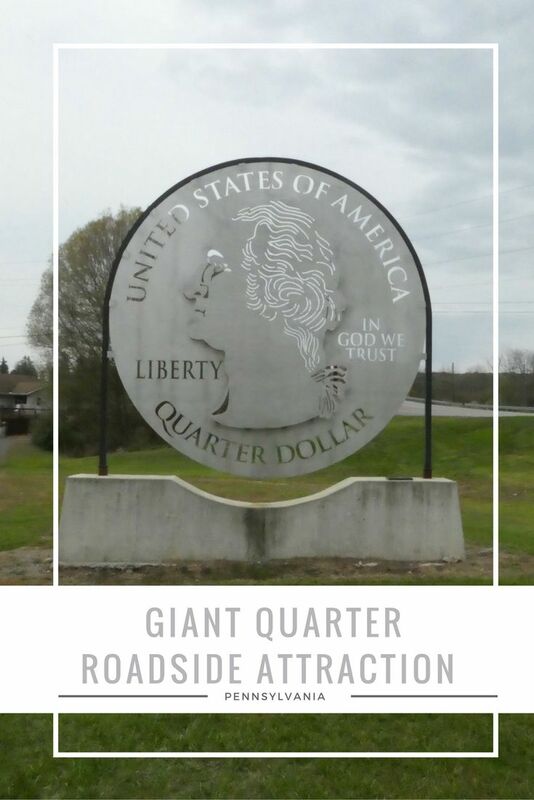 I have never visited the giant quarter, much less heard of it before now. 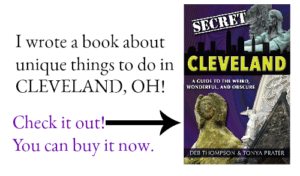 I totally want to check it out once I’m back home in Pennsylvania! What a great stop. We love to find that kind of thing when we are roadtripping. Our girls love to get the photo and I like that there is a bit of learning as well.